Sorry for my hiatus folks, but I was busy becoming a Master of Theological Studies. This, of course, means that I was drinking more and reviewing less, which I am hoping to remedy over the next few weeks (the reviewing, I mean). Today’s review is of The Balvenie 12 year DoubleWood, a single malt Scotch from the Speyside valley. The DoubleWood label refers to the fact that all the whisky has been aged primarily in American oak, and then transferred to first-fill Sherry casks before bottling. The Balvenie has an extensive range of whiskies, many of them finished in various other barrels (the 21 year Portwood is my favorite of the editions I have tried), and The Balvenie has recently won a lot of accolades for their Tun 1401 collection. 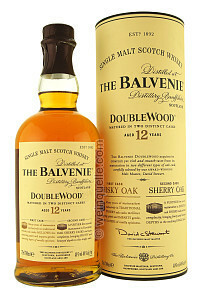 However, like most distilleries, The Balvenie still makes their money off their flagship whisky, the 12 year old DoubleWood. It is bottled at 86 proof (43% abv). On the nose, this whisky is mostly sweet. There are notes of honey, sweet malt, rum raisins, spiced pecans, and toasted wood. The palate is medium-bodied, smooth, and sweet. There is a nice balance of malt, oak, and a wee bit of peat. The finish leaves a bit of oaked spiciness, but it is a rather short finish. Overall, I wish the finish would last longer, but this is a fine whisky. It is a great example of what a little bit of sherry influence can do with a light Speyside malt. It is a short, sweet, well-put together Scotch whisky. My grade: B-. Price: $50-60/750ml. This is a good, solid single malt, but I do think there are better whiskies at lower prices, especially if you are looking for a simple, light Speysider.